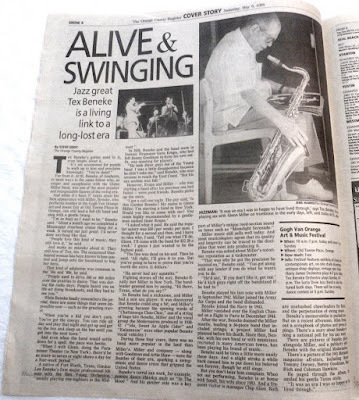 I have always had a soft spot for Tex Beneke. Back in 1995, as someone who had just turned off the radio and discovered big band & swing, I saw a newspaper insert for an upcoming concert in the circle featuring Tex Beneke and His Orchestra saluting Glenn Miller. After coincidentally having just seen Orchestra Wives and Sun Valley Serenade on AMC, I was kinda surprised that anyone from the band was still around...let alone still performing. 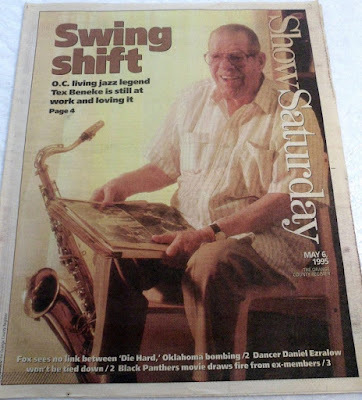 Although Mr. Beneke no longer played the sax, due to a stroke, he got out there for the better part of 2 hours and Chattanooga Choo Choo'd and Kalamazoo'd his heart out. In between a few songs here and there, he would exit backstage while the 'girl singer' gave it a whirl. During one of those spells, my mom took the lp cover I had brought for just such an occasion up to the door where he exited through. Someone from his entourage discreetly took it from her and soon emerged with the cover signed. (Apparently Tex didn't do much signing back then...again due to the stroke. It was asked to keep low key on the autograph while back in the crowd.) When mom made her way back, I slipped it into the camera case without even looking at it. I felt like I had captured lightning in a bottle. The only regret that day was that the camera battery died about 1 minute before the closing song (In The Mood) had ended. Here are several clips from that day. I agree about live music, I just got back from the Bix Fest in Davenport, IA. If you ever get a chance to see Andy Schumm & His Flatland Gang I think you'll be blown away! Since the Beneke concert, I've seen many ghost bands and still get that feeling when they blow those first notes. Since finding out about the annual Bixfest, I've really wanted to attend...hopefully one of these days.